MANILA— A cardinal has reminded the Catholics that the appropriate day for remembering the dead is on Nov. 2, or All Souls’ Day. Cardinal Orlando Quevedo said priests must emphasize this to their parishioners since most Catholics prefer visiting their deceased loved ones on Nov. 1, All Saints’ Day. “What is happening is that, we many Filipinos and dioceses have emphasized All Saints’ Day as the time of blessing the dead and blessing the grave. I think that’s a wrong one,” Quevedo said over Radio Veritas. He lamented that even the government recognizes only Nov. 1 as a non-working holiday which further sends a “wrong message” to the faithful. “I would think that the time to travel to the province would be Nov. 1 and the actual honoring is Nov. 2 and the time to return would be Nov. 3,” added Quevedo. The bishops earlier appealed for a meaningful celebration of the Catholic tradition referred to by Filipinos as “Undas” that cares not only for the dead, but also for the environment. Bishop Ruperto Santos of Balanga also called on Filipinos not to turn grave sites into picnic spots. 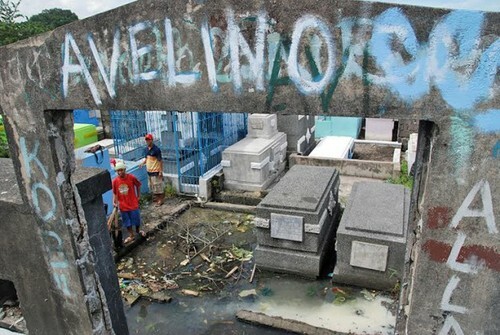 “We go to cemeteries to remember them and their good deeds, not for picnic, not for reunion,” Santos said. Quevedo also called on the faithful to pray not only for the the souls of departed loved ones but more importantly for the repose of the souls in purgatory. “Some of our beloved have passed away they are to be prayed for….but there is a theological doctrine of what we call ‘communion of saints.’ Saints in heaven, saints on earth, those who are church militant, church suffering,” explained Quevedo.